Grocery shopping, entertainment, recipes and more are just a few taps away. 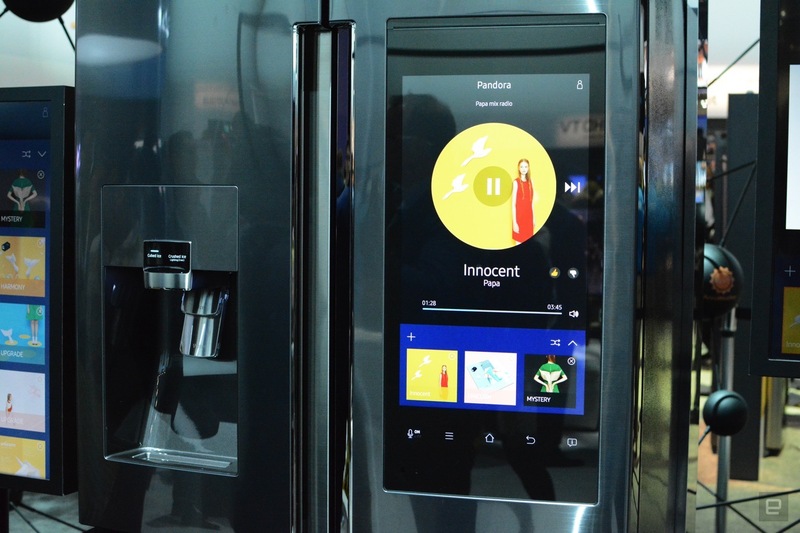 When Samsung announced its latest smart refrigerator earlier this week, we were intrigued. After the company demoed the appliance during its CES press conference, we had to stop and take a look. If you missed the initial news, the new Family Hub fridge is packed with tech. The first thing you notice is the 21.5-inch display in the door, and that screen is the centerpiece of the Tizen-based system. As you might expect, you can mirror what's on your TV or stream music from the likes of Pandora, but entertainment options are actually the less exciting features. With a name like Family Hub, you expect the appliance to do a lot, and it does, starting with the most important thing for a fridge: storing food. Inside the refrigerator, a set of cameras keeps tabs on items so that you know when you need to get more milk and eggs. They also help keep you from eating something that's been in the fridge a bit longer than it should've been. When the time comes to buy groceries, Samsung's latest refrigerator lets you do so from that touchscreen display. Heck, you can even pay for your order and have it delivered. For aspiring chefs, the fridge allows you to search for recipes and guides you through the cooking process with voice instructions. And yes, once you find a recipe you like, you can order the necessary ingredients right there on the door. There's also software that provides a snapshot of your day, complete with meetings, weather and more. To keep up with family updates and messages, an app called Stickies syncs Post-it-style notes to the fridge that are created with the mobile software. If you're going to be late for dinner, for example, you can easily let everyone know. The Family Hub can also serve as a control center for all of those connected household gadgets you have. It plays nice with Samsung's SmartThings gear as well as devices from other companies. While Samsung isn't talking pricing just yet, it has committed to shipping the Family Hub in the spring. Of course, there's the question of whether you really need all of this tech in a kitchen appliance. Based on the few minutes I spent with the device, it's certainly feature-packed, but I don't spend enough time in that room to justify something like this. However, for folks with larger families that like to congregate in the kitchen area, I can see how this would be attractive. For me, the grocery and recipes options would get the most use. And the refrigerator not only helps you remember if you need milk, it provides everything you need to have it delivered so you don't need to leave the house.